"Every instinct tells me it is going to be fantastic. There will be whiffs and wherries and skiffs and schooners and sampans and dhows and dinghies and dories and dragon boats all drawn up in a parping bunting-strewn Dunkirk - except considerably more jolly, obviously. And all eyes will focus on the magnificent Spirit of Chartwell, decorated with gilt and red velvet and boasting two tons of Grinling Gibbons-style carving of Old Father Thames and dolphins and whatnot; and I can confidently predict that when they glimpse Queen Elizabeth on her canopied throne the hundreds of thousands on the banks will burst into roars of acclamation. It is the least we can do." - Boris Johnson, Mayor of London, May 2012. . . . . . . .
From Wick to Wadebridge, the bunting is going up. The global media herd is already filling Heathrow’s clogged arteries. And a week ahead of one of the most colourful and jolly weekends in living memory, one question grows ever louder: Where do I watch it? Hence, the Daily Mail is proud to offer its readers the definitive guide to the great Diamond Jubilee Long Weekend. The whole pageant lines up for several miles west of Battersea Bridge, where it all begins at 2.40pm. It will then continue for seven miles to Tower Bridge, with every section of the flotilla led by its own floating orchestra or ‘herald barge’. The ebbing tide would normally make things much faster, but the authorities have decided this is a perfect day to give the Thames Barrier its annual MoT. The mighty sluice gate will be fully raised to calm the currents. The Queen joins the party soon after 2pm at Chelsea Harbour Pier, where, with Prince Philip, Prince Charles and the Duchess of Cornwall, she boards the launch from the dearly departed Royal Yacht — her first reunion with her old runaround since Britannia was decommissioned in 1997. She then proceeds downriver to Cadogan Pier, where she jumps ship to the Spirit of Chartwell, a specially converted Thames sightseeing boat that will serve as the Royal Barge. The Duke and Duchess of Cambridge, along with Prince Harry, will be waiting on deck, while the rest of the Royal Family will be scattered across other vessels, including Havengore, the launch best-known for its role in Sir Winston Churchill’s state funeral. At Cadogan Pier, the Queen will see the great floating belfry set sail, bells clanging, followed by the 265 man-powered vessels. All will ‘toss oars’ — raise their oars in salute — as they pass her. Next come 54 rowing boats with the flags of the Commonwealth, followed by a ‘herald barge’ with the trumpeters of the Royal Marines. 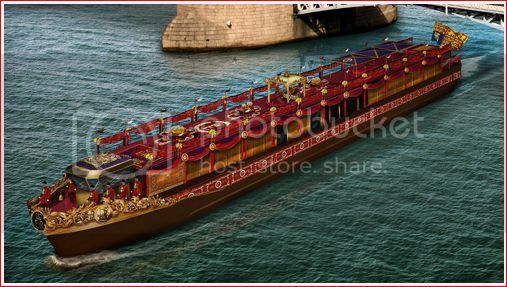 At this point, the Royal Barge joins the procession and leads all the motorised craft through the capital. As the Queen reaches Tower Bridge, those mighty arms will lift in salute and she comes to a halt on the other side. There she will view the rest of the vast cavalcade as it comes honking, parping, waving and saluting its way past her. Ding dong: Eight huge bells will be ringing out from the Queen's Jubilee flotilla. 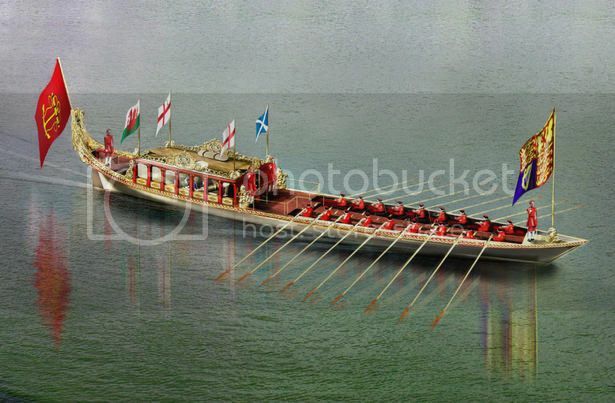 The flotilla for next weekend’s Thames Diamond Jubilee Pageant will be 7.5 miles long, and at the head of it will be these awe-inspiring instruments, hanging from a floating belfry (pictured above). The noise will be extraordinary. 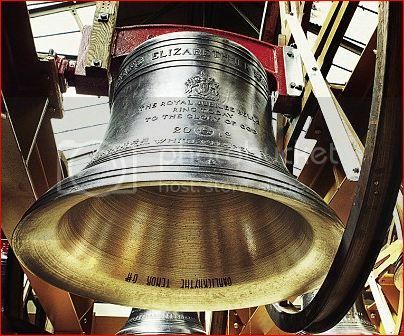 There are eight bells in all (each named after a member of the Royal Family – the biggest at half a ton is Elizabeth (pictured below). The weight of the belfry with the eight bells will be 12.4 tons. 'Anne', 'Andrew', 'Edward', 'William' and 'Henry'. The Times in their report on Charles's visit says that he rang both the Elizabeth and Charles bells and said, "there's nothing like a good bong", which can mean more than one thing. A patriotic great-grandmother has spent more than 500 hours and used over 4,500ft of yarn knitting a woolly version of the Queen’s Jubilee river pageant. Sheila Carter cast-on every day for four and a half months to complete the Royal tribute before Her Majesty casts off for her landmark occasion next month. The metre-long woollen creation shows the Queen and the Duke of Edinburgh sitting on their thrones as their barge cruises down the Thames. I must say, it's a really lovely tribute. I really admire people who can knit so well. My mother started knitting a little newborn's cardigan for my nephew. Almost 5 years later it's still not finished and my nephew's started primary school. I'll have to show her Mrs Carter's masterpiece to make her feel guilty. The largest ever photograph of the Royal Family has been unveiled on a prominent South Bank building in the heart of the capital to celebrate the Queen's upcoming Diamond Jubilee. The giant picture measures an incredible 100m by 70m - giving the Queen the appearance of towering over London at 43 times her usual size - and weighs in at nearly two tons. The image was erected on the Sea Containers building next to Blackfriars Bridge by a team of eight specialists. The chosen photograph was taken at the last Silver Jubilee celebrations in 1977 and is one of the most memorable photographs ever taken of Queen Elizabeth II, Prince Philip and their children. It shows Queen Elizabeth II waving to the crowds with Prince Charles, Prince Edward, Prince Andrew, Earl Mountbatten, Prince Phillip, Mark Phillips and Princess Anne standing on the balcony of Buckingham Palace. 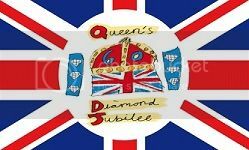 'It is the owner's tribute for this very special occasion, when on Sunday 3rd June, the Jubilee Flotilla passes by and the country celebrates 60 incredible years of everything that makes Britain great.' The giant image is due to remain in place until the end of June while redevelopment work takes place on the building. Yes they will be with the Camerons but they won't be in the Pageant as the Camerons boat will be moored during the pageant at the end of the trip and they will then greet HM when it is over. The HMS President is permanently moored. So Louise and James will be spectators not particpants. Thank you for clearing that up, I was finding it bizarre that they were not going to be with their parents. Lovely that they will be able to see the pageant, even if they aren't participating. Correct me if I am wrong but Peter or Zara will not be with the Princess Royal. They are not even attending, but even so, Peter and Zara are not 8 and 4 years old. I didn't think Camilla liked cruises' or the sea for that matter. camilla's son and daugter are invited to the tamesis event? Doubt it. No reason for them to go. No reason for the Middletons to go either but, according to all reports, they will be there. Except the fact their daughter just married into the Royal Family and have been seen at numerous royal events. The situation with Laura and Tom is completely different, they've never been in the limelight nor even attended a royal event besides the 2005 & 2011 weddings. I'm sorry but I don't see the distinction. The middletons have a daughter who married into the Royal Family, Tom & Laura have a mother who did the same. None are members of the Royal Family and the Middletons are no different to Sophie's father. If Tom, Laura & Mr Rhys Jones were invited but declined that's one thing but, if it were my family, I'd be very hurt if they didn't even merit an invite. I have to agree on this one ... there is no difference between Camilla's children attending and the Middleton's. Once again, I'm not happy with how these event are being organized.